We worry when we hear about an earthquake or tornado, but car accidents actually cause more injuries and deaths. Making our baby car safety needs to be a top priority to protect our kids. From birth until your child reaches a height of 4 feet, 9 inches, your child will go through several car seats: an infant car seat, a convertible car seat, a front-facing only car seat, and a booster seat. Most states have baby and toddler car seat safety laws. While laws may vary a bit from state to state, this guide will give an overview of when to use each type and how to know when it’s time to move up to the next level. Infant car seat: Your baby needs a rear-facing car seat from birth until she turns one. 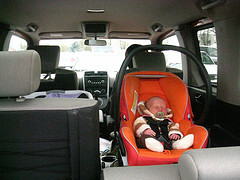 Infant car seats generally can be used until your baby is 22 pounds, but sometimes higher depending on the model. Check your car seat for the specific guidelines for your seat. Weight limits are listed on the seat itself as well as in the instruction manual. Your baby may reach the seat’s limits as early as 6 to 9 months of age. Then, it’s time to move up to a convertible car seat in order to keep them rear facing at least until their first birthday. Convertible seat: Keep your baby rear-facing until your baby turns one and weighs 22 pounds or more. Research has proven that babies are safest in a rear-facing orientation so it’s best to keep them that way as long as you can. When your baby reaches a convertible seat’s height and weight limits in the rear-facing mode, switch the seat around, and use it front-facing until your toddler reaches the height and weight limits for the forward-facing seat. Weight limits for most are generally up to 40 pounds, though more and more convertible models have weight limits up to 65 pounds or more. What's Legal in Your State? ===>> Check out the Child Car Seat Laws for Your State! Forward-facing only seat: As an alternative to a front-facing convertible seat, some seats are forward-facing only. There are many different models available and some can even be used instead of a booster for children up to 80 lbs. Booster seat: Booster seats raise your child up in the vehicle seat to allow the seatbelt to pass correctly across their sternum (not their necks) and low across the child’s upper thigh area (not their abdomen). They use your vehicle’s safety belt to restrain the child. When your child is at least 57”, he is tall enough to use the car’s safety belts. This generally happens when your child is between 8 and 12 years old. Laws vary by state, so check with the Department of Motor Vehicles. To save money, some parents choose an infant carrier with a high weight limit and then choose a select a convertible seat with a high weight limit and a seat belt guide so that it can eventually we used as a booster. This strategy is good for your pocket as well as the earth. To ensure that your car seat is properly installed, and to make the process as quick and easy as possible, it's really helpful to be familiar with the components. In addition to reading the following information, be sure to carefully read your instruction manual and the car seat installation section of your vehicle owner's manual. Also study the labels on the seat itself. Be sure to keep your car seat manual so you can refer to it when reinstalling the seat, changing it to another position, or moving it to another car. All seats have a place to store the manual. Putting in a car seat is trickier than it looks and as many as 75 percent of them are installed incorrectly, leaving children vulnerable in a crash. Consider going to a Child Safety Seat Inspection site. A professional can check to make sure the seat is installed the right way. > Remember take blankets and thick jackets when putting baby into her car seat. After she’s buckled in, you may place blankets or coats over her. The restraint system won’t work properly and the straps may be too tight if you buckle her in with blankets. > Keep the straps snug. Leaving slack in the straps used to attach the seat to the vehicle could result in the seat shifting unsafely. > Never install a seat in the front-passenger position. A child can be killed by inflating air bags.